I’ve never been much of a breakfast person. The thought of food when I first wake up just makes me sick! That was one of my biggest problems before my surgery – I always skipped breakfast. My journey has luckily led me to the joys of smoothies. It’s important to get in a lot of protein as a weight loss surgery patient, so many people rely on protein shakes. With my recent disdain for meat, I’m one of these people. I actually think making my protein shake is my favourite part of my day. I love playing around with powders, additives, liquids, fruits and vegetables. I really enjoy trying to mimic some of my former adored foods. This week I tried to recreate carrot cake in liquid protein-packed form! Place your carrots, ice cubes, almond milk, Greek yogurt, ginger, protein powder and cinnamon – in that order – into your blender. Blend on high until the mixture is smooth. Pour into a chilled glass and enjoy! Tags: bariatric protein recipes, bariatric protein shake, bariatric recipes, bariatric surgery, carrot cake drink, carrot cake protein shake, carrot cake protein smoothie, chike carrot cake smoothie, Chike nutrition, Chike nutrition review, Chike very vanilla, chike very vanilla review, gastric bypass, gastric bypass recipes, gastric bypass surgery, protein shake, protein smoothie, rny, weight loss recipes, weight loss surgery, weight loss surgery recipes, wls. Bookmark the permalink. This smoothie looks amazing Hilary! Just like you, I didn’t really used to eat nor enjoy breakfast until quite recently. 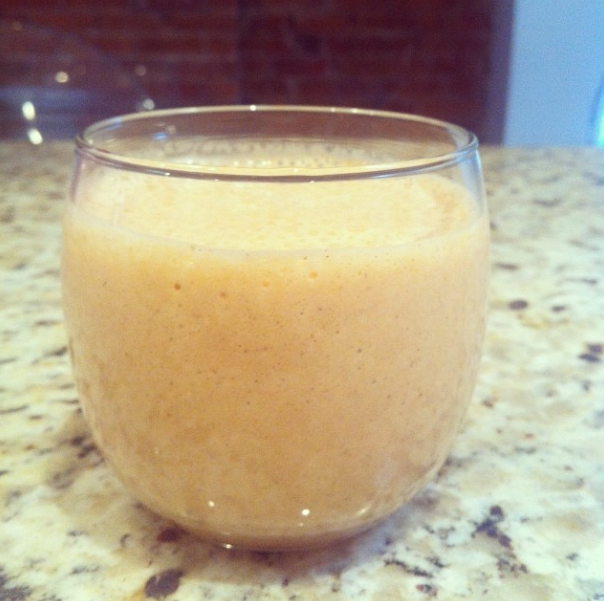 I adore carrot cake, so I can’t wait to try making this smoothie! I love smoothies, it’s such a huge help with my lifestyle change and I always have it for breakfast. It’s helping me lose weight and at the same time I really enjoy the different smoothie styles. I definitely want to try the carrot cake smoothie. Good idea!!! Thanks! I agree, they really help!